Atlanta Institute of Music and Media has a uniquely effective approach to vocational training for musicians, audio production and recording engineering students utilizing a well-rounded curriculum, classroom instruction, stage performances, computer labs, recording studios, and live clinics. If you have a passion for music, Atlanta Institute of Music and Media is the place for you. The AIMM faculty is comprised of industry professionals whose education and work experience as session players, performing artists, producers, engineers, and instructors have prepared them to teach the demanding curriculum. The Associate of Applied Science degree program in Music Production and Audio for Media focuses on the technical application of music, dialogue, sound design, and location audio for film, television, gaming, and all new media forms of expression. This immersive program consists of courses that will help you push your recording and engineering abilities to the next level. Atlanta Institute of Music and Media also provides Music Production and Audio for Media students with a hands-on and instructional environment that will develop and challenge technical and practical talents. In our program, you will acquire the necessary skills to advance your musical aptitude and gain extensive knowledge in the field of Music Production. Important note: On top of the benefits within the program, if you remain in good standing throughout the course, you will have the ability to obtain Pro Tools Certification in music production and audio for film post-production. All students accepted in the Music Production and Audio for Media Associate of Applied Science Program are required to complete the requisite number of General Education credits. Students wishing to attempt to transfer general education credits completed at other institutions must demonstrate appropriate comparability to the applied nature of the general education courses available at AIMM. Atlanta Institute of Music and Media provides Music and Technology program students with the instructional environment necessary to develop both their technical and musical talents. Students acquire the skills to advance their musical aptitude and gain knowledge in the field of recording and engineering. Our Music and Technology Associate of Applied Science Degree has an instrument of focus (Guitar, Drums, Bass, Keyboard, or Voice), with courses specific to that instrument, as well as recording and engineering courses. With the current music landscape leaning so heavily toward home recording, this program offers musicians like you invaluable knowledge of the field of engineering and recording. By combining music and media, we help our students expand their income opportunities because AIMM graduates are prepared to step into the most in-demand positions today, including live event and studio recording, music composition and performance, audio engineering for music, gaming, film, television and more. If you are a non-beginning student, Atlanta Institute of Music and Media's Certificate Programs are a fantastic way for you to develop your talent and acquire the necessary skills to become a top professional musician or engineer. Atlanta Institute of Music and Media's programs are taught by professionals whose work experience, certification and/or music degrees give each instructor the necessary background to teach the demanding curriculum. As a close-knit community, our students are exposed to a diverse range of musical styles, experiences, and backgrounds. Atlanta Institute of Music and Media is state-certified by The Georgia Nonpublic Postsecondary Education Commission and nationally accredited by The Council on Occupational Education. AIMM is an approved Veteran training facility, and financial aid is available for those who qualify. Check out these outstanding performances by the 10 finalist competing for the Tosin Abasi Scholarship. The winner will be chosen by Tosin Abasi and announced on February 1, 2016! If you've ever felt called to create music, produce, or perform, then AIMM is the place for you! The Associate of Applied Science Degree in Music Production and Audio for Media is now offered at AIMM. Learn Pro Tools (and get certified in the process), Ableton Live, DAW editing and processing, keyboard skills, electronic music production, studio acoustics, physics of sound, MIDI synthesis and sequencing, location sound, ADR and foley, the art and science of mastering, and so much more! In this edition of FaceTime FastLane, AIMM drum graduate Josh Baker shares his experiences while on tour drumming for legendary artist Mariah Carey! He's been all over the world with Mariah, and in this episode, Josh gives us a quick peek at life on the road with one of the biggest names in music. Get on the List at AIMM! For more than a quarter century, AIMM has been placing producers, engineers, sound designers, artists, and musicians in the entertainment industry. Are you next? You could be! Join AIMM and get on the list! Are you AIMM's next famous drummer? 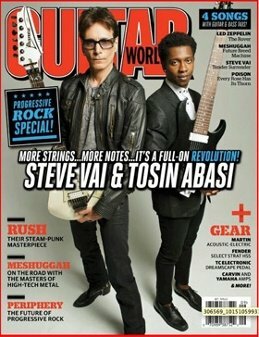 In this video, "Animals As Leaders" guitarist and AIMM grad Tosin Abasi discusses how he found AIMM and how it helped him as a musician; gaining endorsements; and landing on the cover of Guitar World Magazine with Steve Vai! Check Out AIMM's Instagram Feed!